Maybe not "work" work, but they all focused on getting a finished product, from illustrations to client projects, income to comic pages and Etsy stickers. You can find my creative business & blog planner setup for 2018 here! So, in the middle of January, I re-adjusted just a little bit. Do you have goals that don't focus on an end result, but on the process? If not, grab a pen and blank sheet of paper (or open your journal) and get thinking! I found six different creative & personal goals that I want to pursue in my free time. As a guiding word for 2018, I chose "PRACTICE". It can mean both getting better at or just pursuing something. I want to improve but focus on just the daily or weekly act of doing, instead of having to reach any milestones. Yes, I'm a freelance illustrator. Yes, I work in watercolor for nearly all my commission pieces. But while my other design jobs always keep me on my toes to learn new skills in programs like InDesign and Illustrator, I've just stuck to what I know in watercolor. So in the new year, I want to experiment with new color combinations, try new materials, practice painting things that I've had no experience with. No concrete goal in mind, just a constant reminder to experiment and be open to new ideas in my sketchbook! I LOVE hand-lettered fonts. Hand-written cards. Fancy journal pages. I really want to practice my own lettering skills and so far, I enjoy using slightly different styles for my journal entries. Consistency is key, so writing in 'fancy' calligraphy as often as possible is my goal. Last year, I started this blog and took up journaling. I also got back into sketchbooks not as a way of just doing concept work for other projects, but for their own sake. As a result, 2017 is so much better documented than the years before! It's like having several diaries, and looking back at the end of the year reminded me of so many events and people that I'm thankful for. With that in mind, I want to focus on keeping little memories in 2018, too, be it through photography, sketches, rambly blog posts, or journal entries. 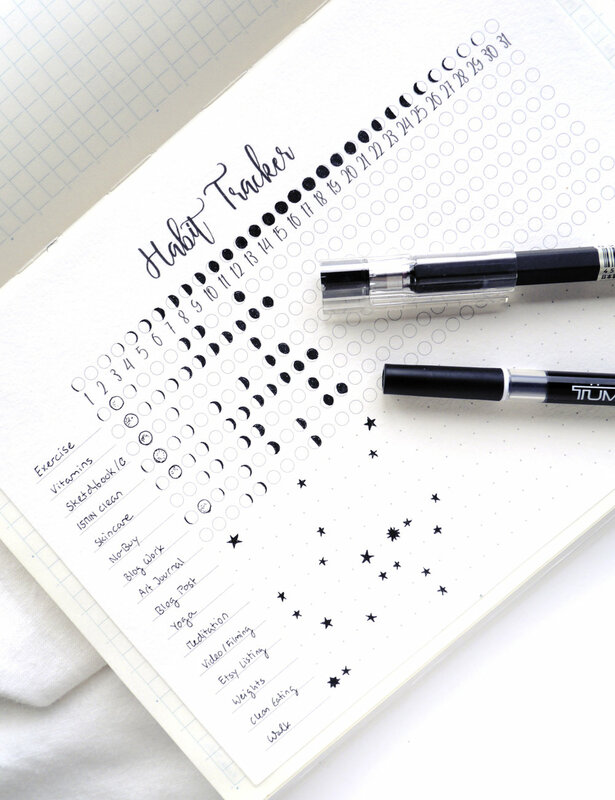 I even added an "art journaling" category to my habit tracker to make sure I stick to this easily forgotten part... You can find out more about the dual habit tracker system I'm using here! Having practiced Yoga on and off ever since university (yay, free classes! ), I did fall off the wagon a bit this year. A mixture of hectic schedules and getting into weight lifting (with my itty-bitty dumbbells...) are the culprit. And while I won't give up weights, I do want to move past the slump and go from the occasional stretches back into extended yoga sessions. I love Yoga With Adriene, and she's got so much new content for me to work through! Oops. Now in my fourth year of living in South Korea, I've gotten lazy. When I came here I barely knew how to say hello and thank you, and was very motivated and diligent with my self-studying. I had to pass the TOPIK, after all, and I'm a bit competitive and obsessive when it comes to language skills! After 2016, I was at a comfortable level. Small-talk with visitors, conversations with my in-laws, dumb jokes among friends - I just didn't have the motivation to keep going with the same intensity! While I still haven't found a Korean language class that I could go to, I want to get back into studying so that I can get from competent to actually fluent in a few more years. Fingers and pens crossed! I plan on going back to this series of grammar & vocabulary books, brush up on forgotten vocabulary, and review some of the latest TTMIK lessons. I've got a YouTube channel where I post speed-drawing videos and little sketchbook sessions. But this year, I want to learn how to properly edit beautiful (?) art videos, get better at voice-overs and generally generate more than a couple videos per year! Do you have personal, small goals like these that you want to stick to? If you're still in the process of planning and reflecting (it never really ends, new year or not!) I've got new printables both in my Library and my Etsy shop. I hope they make your planners, folders, and diaries just a bit more fun and creative! Sign up with your email address to receive passwords & blog updates!